So fellow travelers, Japanese books are printed in the reverse format of western books meaning the front cover and first page are what we consider the back end of our books. 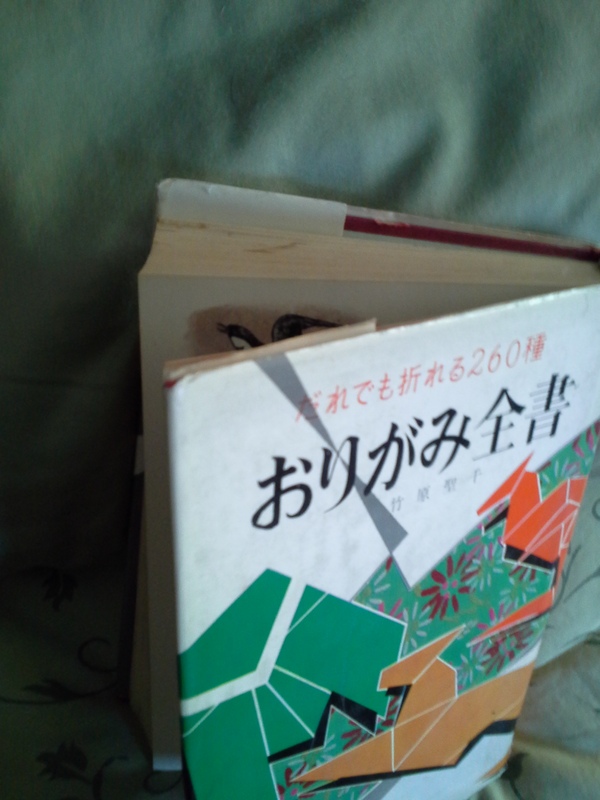 Not so great shot of my favorite origami book, just to illustrate this reverse printing. 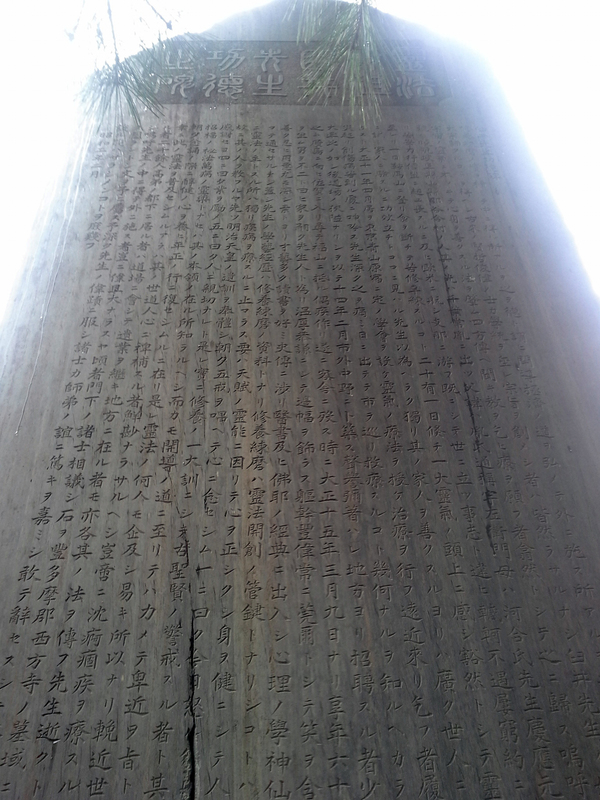 I have never found a clear explanation of how this reverse format came about, although I gather it did have something to do with the tradition of writing characters in columns rather than rows. The format is so prevalent, even books in English are printed “back to front” I suppose because the printing presses are set up to create books this way regardless of the content language. Whatever the reason, this back to front printing process symbolizes how I feel when I am in Japan; it’s as if I am doing everything in a mirror image. Anyone who has tried to do anything while looking in a mirror knows the odd feeling of being here and while moving over there at the same time. 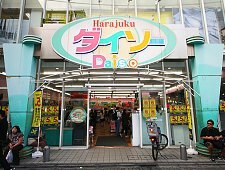 So it seems fitting to begin this series about Japan by starting with what I did on my last day there. Throughout my time in Japan, I posted a daily photo journal in my Instagram feed (sagemtn57 if anyone wishes to follow my photo journals) and I continued to write entries but none of the pieces came fully into completion after my first heat induced Tokyo post, because one element of the trip loomed large in the background of every experience. The moment of parting from my daughter. 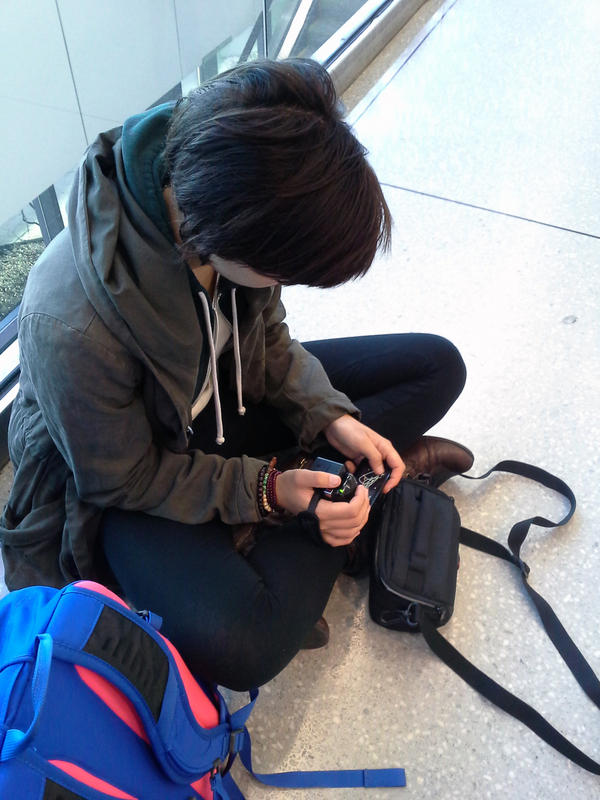 Favorite Youngest Daughter, checking new video cam at the airport before we all headed to Tokyo. It was not something either of us dwelled on. There was too much to do, getting her settled into her dorm, visiting the neighborhood shops, learning to navigate the efficient but complex Tokyo Transit system even as she dove head first into exploring the cultural experience of Being in Japan . By the time my husband and I boarded a train for five days in Osaka and Kyoto, my global adventurer and her new friends had started deciphering the megalopolis that is 東京 even figuring out what to do when they were lost. In fact the campus staff reassured everyone at the parent orientation that getting lost is a frequent occurrence, indeed almost a tradition even for the most seasoned of local residents. With Tokyo’s well founded reputation as the safest city in the world and a well organized campus emergency contact system in place (we know it works, our daughter of course tested it first hand within a few days, with perfect results) our kids were reasonably safe. and acquired some basic supplies for her dorm room. The day we went shopping together to complete her list, I was impressed with her practical outlook of working within a budget. Her college move had none of the usual loading an SUV to the roof with boxes. You pack differently when all the belongings you are bringing to college have to fit in several suitcases with a strict fifty pound weight limit. Two of our three carry on pieces for the flight over were her guitar and violin. When we returned to Tokyo from a whirlwind expedition of ancient temples, historic sites and unique dining adventures (don’t worry those blog posts are pending) we were greeted by a confident young woman looking quite fashionable (they had discovered the amazing bargains of Tokyo’s ¥500 ((that’s just over $4 )) thrift stores) carrying a signature umbrella (because every Tokyo resident knows it can and will rain without warning) who didn’t hesitate to travel across the city to meet us. 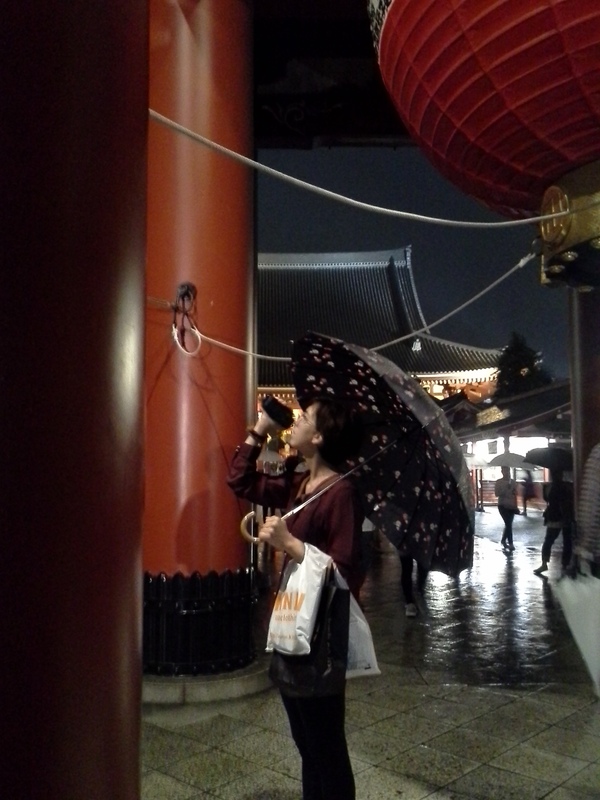 Favorite Youngest Daughter, capturing Sensoji Temple in the rain for her video blog. There were still a few details to settle, like navigating the maze of bureaucracy to set her up with a cell phone she could use in Japan. (There are unusual restrictions on cell phone features in Japan and special exemptions are required since anyone under 20 is not yet an adult in Japan and contracts usually require a signature of a Japanese resident.) But while we were away she had, with minimal assistance acquired her ward residency card, registered for National Health Insurance (required for anyone not on a tourist visa) and purchased her student commuter pass which gives her a discounted rate on some of the transit system. She had even done some grocery shopping and cooked a few meals in her tiny kitchen. I sensed she was growing comfortable with taking in these adult tasks. So every time The Moment edged into my view, I would acknowledge it’s presence, blink back a few tears and refocus on experiencing the moments at hand. 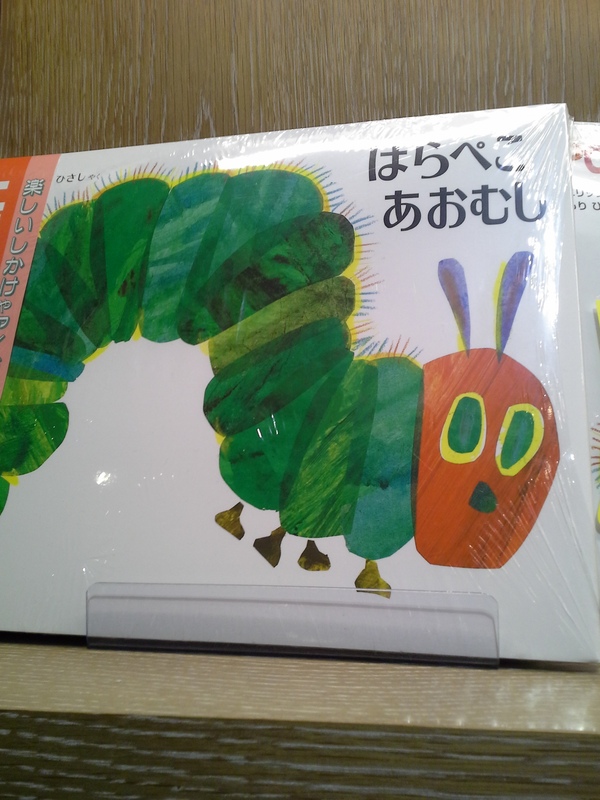 Finding a favorite bedtime storybook in Japanese. There was another shift I perceived more subtly. As often as my daughter had plans to do things with her new friends, she was just as eager to go places with us. Every day of our last extended weekend before her classes began she wanted to meet for at least part of the time and do something new. Saturday, she had several festivals picked out for us to visit. 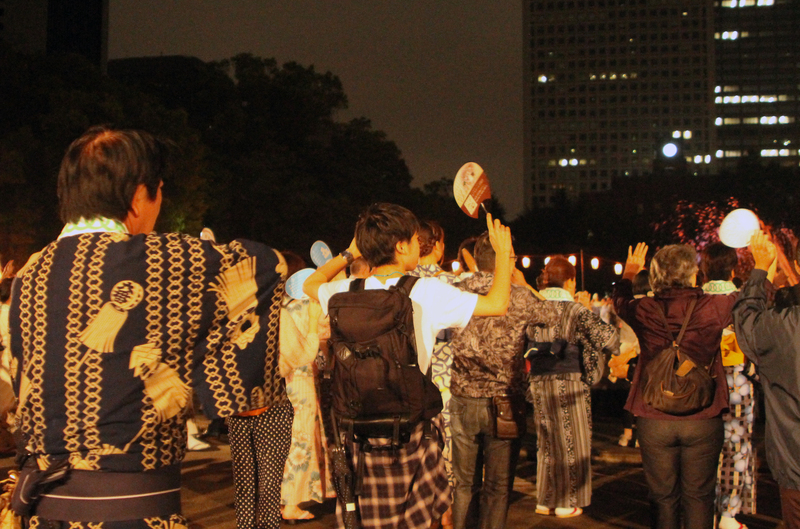 Although the two hour marathon of processing paperwork at the cell phone store cut into our time, we did make it to one of the evening festivals being held in Hibiya park. 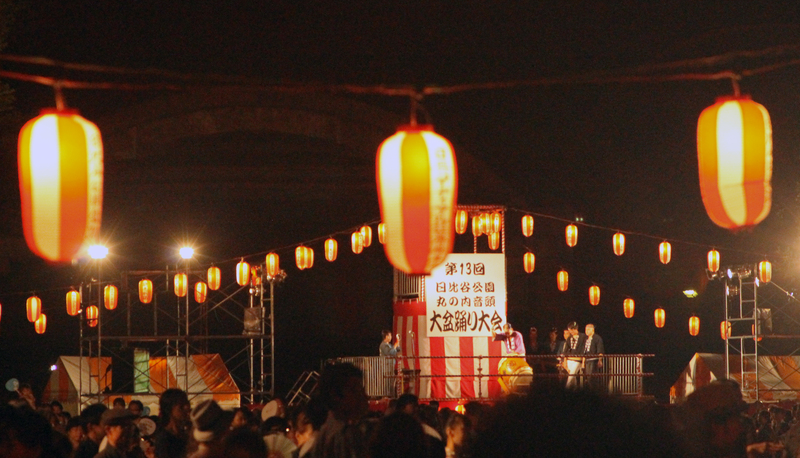 It was a park I had visited years before in my teens, but I had never seen it like this, all aglow in lantern lights and packed with people of all ages who had gathered for the Japanese equivalent of line dancing to traditional folk songs and taiko drums. She and I joined the crowd for a couple of songs. The day before we were due to fly home, she showed me an envelope she had brought with her. I was perplexed since it had her name written on the front in my handwriting. When I looked inside I found a collection of cards and notes I had written to her. Some were encouraging, some were “sorry I snapped” or simple love you notes, some were funny, one was from our dog apologizing for chewing up one of her stuffed animals and offering a replacement purchased with from a savings of dog treats. Of course we both cried as I looked through them and she thanked me for being a good mom. It was a moment that brought every tough passage of her teen years into perfect balance. She told me she was not scared of being on her own, because I had helped her be ready, but she said she was realizing how big an adjustment this was now. “This is hard because from this time forward, we will spend more time apart than we will together. ” She nodded quietly and tears flowed for both of us. The next morning we had tentative plans to meet for breakfast. She did not have classes until later in the day and our flight was schedule to depart in the late afternoon. I woke far earlier than I expected, having been up well past midnight carefully packing the many treasures we were bring back to share with family and friends. There was one thing on my list of places to experience which we had not yet fit in. A few minutes of research on google maps, a quick series of messages between us (turns out my daughter was also up early) and we had a plan in place. It was time to make a pilgrimage to a sacred site.